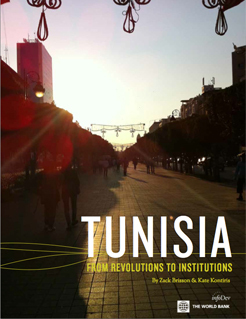 Download this first-of-its-kind World Bank investigation into the role of technology in post-revolutionary Tunisia. In January 2011, Tunisians overthrew long-time autocrat Zine el-Abidine Ben Ali, setting off a chain of political upheaval around the world. One year later, Tunisia remains a work in progress. Signs of change are evident across the country, as Tunisians work to build a new government and fulfill the promises of their revolution. Opportunities—and challenges—abound. Critically, Tunisians must repair the deep disparity that divides their country between well-resourced coastal provinces and an underserved rural interior. This challenge affects nearly all sectors of Tunisian life, from economic development to political representation to education. Technology played a key role in revolutionary Tunisia, tying together dispersed individuals and enabling them to express their frustrations as a powerful collective. Information and communication technologies (ICTs) will continue to influence the new Tunisian society and economy. Reboot has produced this publication as part of a larger project led by infoDev on the role of ICTs in post-conflict settings. Our team traveled across the country, learning from Tunisians about their hopes, problems, and aspirations for the future. This site highlights opportunities and challenges in the critical sectors of politics, education, and business, and how these are affected by regional inequality and the blossoming of an online civil society. In sharing these insights, we hope to shed light on how Tunisians and the international community can best identify and respond to the country’s needs, and provide a 21st-century model for post-revolutionary states. Landing page photo: Clock tower on Mohammed Bouazizi Square, renamed after the man whose self-immolation became a symbol of the Tunisian Revolution. The collapse of the Ben Ali regime and its restrictions on political expression left a void that has been rapidly filled by a multiplicity of formal and informal interest groups. In addition to giving rise to a vast array of new political parties and media outlets, this phenomenon has also manifested a variety of grassroots gatherings. While Tunisians are initially struggling to parse the flood of new voices and information, these developments are an encouraging sign of a newly open and free political environment. Tunisia’s political ecosystem has been quickly populated by an explosion of political parties, with platforms and ideologies as diverse as Tunisia itself. 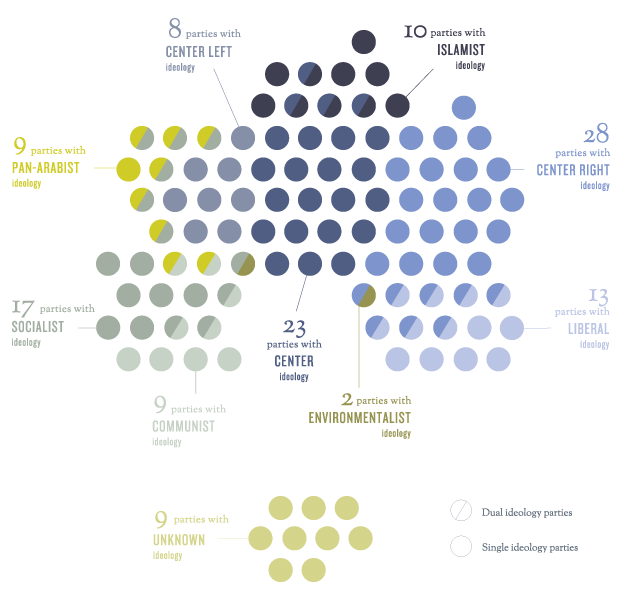 The below graphic charts the relative distribution of these parties across the political spectrum. This uncharted political environment has resulted in a corresponding demand for reliable, independent media resources to help citizens make informed political decisions. The Tunisian higher education system has long been held up as a model for the region. The revolution revealed that the strengths of Tunisia’s university system had been substantially overstated by the Ben Ali government. University leadership, students, and business leaders all highlight significant gaps in the quality of instruction and infrastructure that must be addressed in order for Tunisia to develop a globally competitive knowledge economy. Tunisia has a strong foundational infrastructure upon which to build an improved higher education system. A critical challenge for Tunisian leaders will be to bolster the interior provinces, where economic progress is stymied by a paucity of educational resources compared to the wealthier coastal provinces. Local business growth is critical to the health of any national economy. If properly cared for, entrepreneur-led small and medium-sized enterprises (SMEs) can form the backbone of the new Tunisian economy. Although there is significant untapped growth potential, particularly in the technology sector, entrepreneurs in Tunisia today face critical constraints, including elevated costs of doing business, government control of critical markets, and skill deficiencies in the workforce. Uncompetitive business practices encouraged through the patronage systems of the previous government. Difficulties with foreign exchanged caused by government limitations. Bureaucratic inefficiencies within contracting and procurement processes. Lack of secure, reliable payment touchpoints for online and mobile consumer transactions. More opportunities for training and engagement with multinationals. Training in product research and development. Increased respect from international partners that leads to higher-value contracts and engagements. More mentoring, soft skills, and applied business training. Technology has enabled previously dispersed individuals to express their collective interests to a broad audience. The ability to easily engage and share one’s passion online can turn even the most apathetic and isolated citizen into an activist. This connectedness was key to the growth of grassroots political communities during the revolution. Technological and political shifts have fostered communities who draw their identities and livelihoods from the digital sphere. This graphic introduces four of these online communities and their visions for a new Tunisia. Reboot is a social impact firm dedicated to inclusive development and accountable governance. We help governments, foundations, and international organizations achieve their missions. 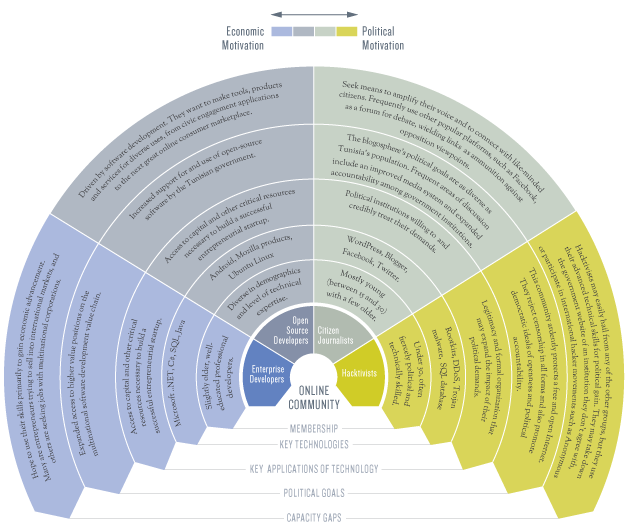 We explore the origins of complex issues, design contextually appropriate interventions, bring these ideas to reality, and evaluate the results along the way. The possibilities for inclusive development and accountable governance are growing. From supporting good governance in Nigeria to human development in Nicaragua to civic innovation in the United States and beyond, we are working to realize them. infoDev is a global partnership program within the World Bank Group which works at the intersection of innovation, technology, and entrepreneurship to create opportunities for inclusive growth, job creation and poverty reduction. infoDev assists governments and technology-focused small and medium sized enterprises (SMEs) to grow jobs, improve capacity and skills, increase access to finance and markets, ensure the appropriate enabling policy and regulatory environment for business to flourish, and test out innovative solutions in developing country markets. We do this in partnership with other development programs, with World Bank/IFC colleagues, and with stakeholders from the public, private and civil society sectors in the developing world.